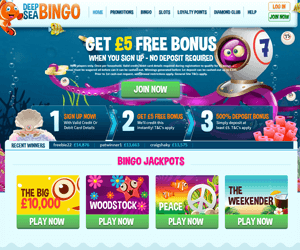 Dive Into Deep Sea Bingo | Collect your splashing £25 Bonus! Grab your scuba gear and prepare to dive into Deep Sea Bingo, the newest underwater bingo site adventure for 2016! When you leap onto the aquatic reels of this Cassava/888 site, you'll be greeted by a quirky set of animated fish characters, from a Finding Nemo little mascot to a crazy-eyed purple Octopus! After you collect your splashing welcome bonus, you can reel your way to oceanic riches and play a whole host of underwater bingo, slots and casino adventures! While you fish for big wins, you'll be rewarded with an array of aquatic treats, bonus perks and Jackpot delights! For starters, you can pick up your awesome £5 Free No deposit bonus. When you take the plunge and decide to deposit your first £5 or £10, you can hook in a 500% bonus, to start playing with an extra £25 or £50! You can then uncover big ocean treats like the £700 Weekender, a share of £10K and the 2 Million Race, as well as extra perks in the chat community and VIP loyalty club! Since Deep Sea Bingo is the place to be, you can have a splashing time discovering a range of bingo, slots and casino hits! You can hook in big wins with themed bingo games like Fishy Favourites, as well as Free Bingo and Daily Jackpot Bingo! The slots lounge is overflowing with action-packed adventures like Fluffy Too, Rainbow Riches and Starburst. If you're still thirsty for more, you can head to the casino lounge to soak up the fun with Roulette and live tournaments!